Orange County, Calif. (USA) -- IN THE MIDDLE of the night, Dale Lechtman wakes up, all kinds of thoughts crowding sleep out of her mind. But Lechtman uses meditation to handle insomnia. Lying in bed, she focuses on breathing. She takes in air deeply. Then, she expels it through her nose and mouth slowly, as though she were trying to make a feather float on her breath. Thoughts relentlessly pound at her mind's door, but in time, they are no match for Lechtman's skills. They disintegrate harmlessly into darkness, and, finally, the 62-year-old nurse from Westminster is relaxed enough to resume sleeping. Lechtman has found that secular meditation -- the deliberate quieting and focusing of the mind and body -- can be beneficial to her health. As patients and doctors seek answers other than medications to treat illnesses, some are finding that meditation can be strong medicine. More doctors have opened their minds to the idea of meditation as complementary therapy as more studies emerge linking better health and meditation, said Dr. Roger Walsh, professor of psychiatry at UC Irvine. Walsh has published research on meditation and teaches the practice as an elective to medical students. • A pilot study led by Walsh suggested that meditation is useful in understanding the effects of antidepressants and might be useful as maintenance therapy for depression. Researchers found that meditation -- like antidepressants -- fostered a state of equanimity. This is the ability to tolerate and not be disturbed by potentially provocative or stimulating thoughts, events, encounters or experiences. The study appeared recently in the Journal of Mental and Nervous Disorders. • A study presented at a recent American Heart Association meeting found that transcendental meditation, or TM, reduced the severity of risk factors in metabolic syndrome. This syndrome is a collection of conditions that lead to heart disease, such as high blood pressure and increased blood-sugar levels. People who practiced TM significantly decreased their levels of blood pressure, blood sugar and insulin, said Dr. Noel Bairey Merz, study author and medical director of the Preventive and Rehabilitative Cardiac Center at Cedars-Sinai Medical Center in Los Angeles. Merz continues to study the effect of meditation on heart disease. • Preliminary results of a study on meditation and binge-eating disorder showed that meditation can help people "reconnect" with their mind and body to understand when to eat and when to stop. Mindfulness meditation can help those with the disorder gain control over their eating habits, said Jean Kristeller, professor of psychology and director of the Center for the Study of Health, Religion and Spirituality at Indiana State University. This research joins an increasing body of knowledge based on science rather than on religious beliefs, whether rooted in Buddhism or Christianity. Religious elements can be present in meditation, but it's also possible to practice meditation without them. Some meditators in hospital settings say the turning point for meditation in medical practice came after 1975, when Harvard University researcher Dr. Herbert Benson first wrote about the value of meditation in treating illnesses in the book "The Relaxation Response." Meditation already is an essential part of the Dr. Dean Ornish program for reversing heart disease, which impressed Lechtman and her husband, Max. This year, the Lechtmans took weekly beginner meditation classes taught by Martha Jensen at UC Irvine. 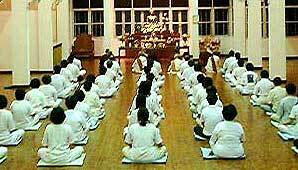 In these classes, Jensen teaches a range of meditation techniques in sets of four weekly sessions. Meditation practitioner Cheryl Medicine Song-Procaccini also introduces participants to various meditation techniques in monthly classes at the Cordelia Knott Center for Wellness in Orange, which is affiliated with the oncology and breast centers of St. Joseph Hospital. At Mission Hospital in Mission Viejo, meditation is part of a stress-management program offered by the hospital's cardiac rehab services. People with medical conditions such as cancer or heart diseases take the classes, as well as those who want to deal with stress, according to Jensen and Procaccini. "Everything we learn in the meditation chair we can use in everyday life," Procaccini said. "As we strengthen our concentration, we become less reactive to what's happening to everything outside of ourselves." It's important for beginners to be exposed to different types of meditation to find one that's right for them, Jensen said. One person may find walking meditation effective, while another may prefer to use a mandala, a symbol upon which one concentrates. Some choose to chant a mantra or repeat a prayer or word, such as peace or calm. A common mistake some novices make is to try a type of meditation and not like it, then give up without experimenting with other ways. Not surprisingly, time -- not motivation -- is the biggest obstacle to maintaining the practice of meditation, said Dr. Wadie Najm, associate professor of family medicine at UC Irvine. Longtime practitioners recommend meditating twice a day for 20 minutes each time. "It's not as quick as taking medication," said Najm, who has recommended meditation to some patients. It requires a time commitment, much as exercise does. Sometimes, meditation helps the body and mind so much that patients can reduce their dosage of medications, such as drugs to reduce blood pressure or stress and anxiety, Najm said. In a few cases, meditation has proved so effective that it picks up where medication leaves off. To maintain the state of equanimity that sometimes results from meditation, meditators have to continue practicing throughout life. Even longtime meditators are never completely rid of intrusive thoughts and distractions but, with practice, are better able to deal with them, Walsh said. "The biggest myth is that if one learns to meditate, one will never feel upset," Procaccini said. "Meditation is not about getting rid of difficult experiences or feelings. It's about learning to cope with them. We learn to develop a more accepting outlook, with less resistance to life." Sit, as if on a throne, with dignity and stability. Allow breath to move gently through your body. Let each breath be like a sigh, bringing calmness and relaxation. Be aware of what feels closed and constricted in your body, mind and heart. With each breath, let space open up those closed-in feelings. Let your mind expand into space. Open your mind, emotions and senses. Note whatever feelings, images, sensations and emotions come to you. Each time a thought carries you away, return to your sense of connection with the Earth. Feel as if you were sitting on a throne in the heart of your world. Appreciate moments of stability and peace. Reflect on how emotions, feelings and stories appear and disappear. Focus on your body, and rest for a moment in the equanimity and peace. Sit this way for 10 minutes. Slowly stand up and take a few steps, walking with the same awareness as when you were sitting. -- Source: "The Meditation Year"